I HATE pictures of myself... But I don't like not knowing what I look like. Yesterday Mark and I were out and a girl passed, and I had to ask him if we were about the same size. He just shrugged, and said I was a little smaller (it was an "OK" answer). A few minutes later, we realized she wasn't even pregnant!! Oops! I had yet another Dr's appointment this past Wednesday. I know in past blogs I've mentioned that I don't like my doctor, however, I have really grown to like her. She is very straight forward, and I know that I will be taken care of. She has not said anything about my weight gain, mainly because one visit I won't have gained anything and the next visit I will have gained 4 pounds (DUMB cookie dough that calls my name!!). 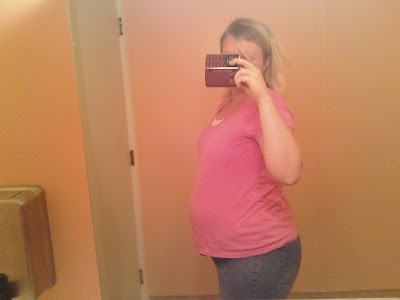 I figure I weigh what I did when I had Grant, so I'm doin' ok... Just the thought of losing it AGAIN is frustrating. You look GREAT!!!!!! I am so happy for you!! I can't wait to see pictures of her! Good for you for taking pictures. It is a reality I could never stand while I was pregnant but I always wished afterward I would have done. You look good for having only one month left! Good luck on your last month! Having an exact date is probably easier emotionally than wondering when in the world the little tyke will arrive. Yay, how exciting!! It really has gone by so fast! And your baby belly is so cute! Wish you were here so I could visit cute little Cami after she's born!